Who is a true brahman? The Love of The One! I caught this tuk in sikhchic.com’s TODAY’S QUOTE the other day. This is the Third Master reiterating the credal message loud and clear. Guru Nanak had freed us all from the Hindu pestilence of caste, and each Guru thereafter tried to hammer it into our brains that such demarcations are unacceptable in decent, civilized societies. Guru Gobind Singh, in giving Sikhi the finishing touch, then crystallized Guru Nanak's gift of equality by giving each us the status of “Singh” and “Kaur”. We were all elevated to being brahman, if being brahman meant you had the monopoly on God. In that sense, every Sikh -- nay, anyone -- who is dyed in the One is a brahman. Then, pray, where is the room left for controversy. I don’t understand it. I know people right here in the very community where I live, in the very land where the Gurus lived and spread their message for two-and-a-half centuries, who then soil themselves by claiming to be ’low’ castes, as if it was a matter of pride to be insulted and abused. Why would you, if you are a Sikh, why would you want to be then called a khatri or jutt or dalit or whatever? Somebody else said it so aptly once, in these very pages: it’s like slapping yourself every time you identify yourself as anything but a Sikh. 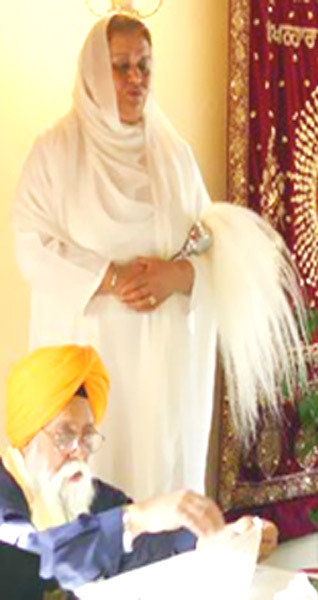 Being a Sikh is akin to being a brahman, says the Guru. Not to say we’re better. But to say that we’re all equal. The great leveller is the Dye that colours us the same, and makes us one with each other and with the One. It’s our birth right, not just a privilege. 1: Jaspreet (Canada), November 16, 2012, 12:34 AM. The Sikh Gurus certainly saw this evil for what it was. Many refuse to follow the teachings, though, and follow the fake Brahmins who want the evil caste system in place. The rationale behind it? That Brahma made the Brahmin from his mouth, the Khsatriya from his arms, the Vaisya from his thighs, and the Shudra from his legs. The untouchables (non-Aryans) weren't made from any part, so they were considered the lowest. What a ridiculous ideology. Once, while working as a substitute teacher, I was in a classroom and this Punjabi kid in his early teens, goes, "Are you a jutt, Miss?" He had a gold khanda and chain around his neck. I told him Sikhs don't believe in caste. He still wouldn't stop. So I told him that jutts were considered a lower caste in the Hindu system, because of the nature of the farming work they traditionally did. At that, all the white kids started cheering and clapping. Apparently all he did day in, day out, was go on about how great jutts and Brahmins were. There were a couple of Brahmin kids there too, much wiser than him, who didn't say anything. He had the audacity to make the comeback that that was in the olden days and now they were respected. I dropped the matter for there was work to do and I didn't want to continue arguing. However, looking back, I think I should have gone to the principal after school and have reported it. It is a form of discrimination, just like overt racism, something warranting suspension, certainly if directed at someone, with a zero tolerance policy of discrimination in that school board that should have been my obligation but I just went home. Then there was the time I was working at a factory with a lot of Punjabi women. I found anytime I spoke up against the caste system, folks immediately asked me my last name. They were sure I was a Dalit. My parents were farmers too, but I have decided as soon as I can afford it I am going to dump my last name as these Indian last names are names to designate caste and only Singh and Kaur should be used by all Sikhs. We come into a land where the great principle of all being created equal is the law, yet this unholy baggage from India is taught to the young people who will then teach it to their children. Sikhs need to stop this evil, especially after we have all experienced some form of racial discrimination ourselves. You'd think a little empathy would kick in. Yet inspite of my rant, I will say the number of Sikh 'inter-caste' marriages seems to be going up and without parents having to be embarrassed over it. Was I ever shocked when a friend of my mother's, a real bag of contradictions (a friend to all the low castes in town, yet being so proud of being a jutt) told her daughter it was fine if she found someone not a jutt (the girl was in her 30s, maybe that was the reason, but whatever, it is still good that she said that). I listened to a professor on Youtube, a lady from Yale, give a talk on caste. She said it is a system maintained by violence and that thousands of people are killed in India to maintain it. And indeed, it isn't just physical and sexual violence but also emotional and psychological violence. In Punjab caste is more diluted than in Hindu societies but it is still there and maintained by a lack of distribution of the wealth, feudal ways of thinking, and a lot of verbal and emotional abuse. Have a heart, is what I say. The evil are those who don't believe all are created equal and have no empathy for those more unfortunate than them. 2: Prakash Singh Bagga (Indore, MP, India), November 16, 2012, 12:41 AM. It will be worthwhile exploring the meaning of 'brahm' as well. 3: Jaspreet (Canada), November 16, 2012, 8:02 AM. What I find interesting is that caste is also practiced in India by Muslims and Christians too. Their faiths also say all humans are created equal by God. Of course, the devout don't. Good Hindu people don't believe in this nonsense either and want to abolish it. I hear the British really strengthened caste for it helped them capitilize on divisions even further. India too did take their system of castes and has legally labelled people even though it officially says people are equal. I really wonder how caste can be ended in India. Some folks convert to different faiths. That doesn't always help for it continues. Some adopt Buddhism as Dr. Ambedkar did, as the leader of the Dalits, some decades ago did. That perhaps will help if the vast, vast majority of Buddhists are Dalits. It might help raise the self-esteem of Dalits anyway. I have heard of Dalitistan, a separate nation for Dalits, advocated by one person in a book (he said his passport was taken away by the Indian government and he is not allowed to go abroad to speak). He felt that will be the only way to end this oppression that is thousands of years old. Marxism is also something Dalits revert to. The Dalits have to do something for it end. Waiting around for the different religions to get rid of the malice in their hearts towards Dalits will accomplish nothing for the Dalits. I have heard that according to Sikhism those who believe in caste will not attain salvation. My hope for the Dalits, may their struggles for equality be successful. During feudal times, Europe also had a caste system though it wasn't called such a thing. The serfs were a the lowest rung. They worked land they did not own under harsh conditions and had a really low quality of life and 40 was a ripe old age. They were taxed a lot too. They revolted more than once but unsuccessfully. The priests helped with this system too, telling people their reward for suffering on earth would lie in heaven (one reason why Marxism calls religion the opium of the masses). Some think the plagues changed their status. The plagues killed off a lot of people and then the ones left could sell their labour for higher prices. 4: N. Singh (Canada), November 16, 2012, 10:36 AM. 5: R. Singh (Canada), November 16, 2012, 3:50 PM. The teacher (described above in a comment) should've told the erring child that even if one is proud of oneself, there is no need to look down on others ... instead of the teacher embarrassing the child. There is no superiority of any caste, it is one's deeds that determine one's status here, for all are born different but equal. Lectures do not change minds, but compassion and kindness does. 6: Ajit Singh Batra (Pennsville, New Jersey, USA. ), November 17, 2012, 7:38 PM. Unless the social conscience of people is based on equality, the caste system is not going to disappear amongst Indians. Even the Indian immigrants carry this baggage of 'race and creed' and induce it in their children. 7: Prakash Singh Bagga (Indore, MP, India), November 20, 2012, 12:16 AM. This message is not restricted to Sikhs only. It is that whosoever (irrespective of caste or religion) contemplates God is a Brahman. It gives total equality to all. 8: Sohan Singh (Bellingam, Washington State, USA), October 05, 2013, 11:55 AM. Yes, we are all brahmans in the sense that we bow to no worldly power. But we lose our edge if we then use caste names and fall into the Hindu trap of treating some people less than us. To begin with, a Sikh should be using nothing else but Singh or Kaur as a last name. If we profess equality, we have to live it. The Talking Stick Colloquium # 95"